What teenage girl hasn’t wondered what it would be like to be someone else? To be more popular? Now imagine you’ve figured out the secret to actually do it, to change your life. 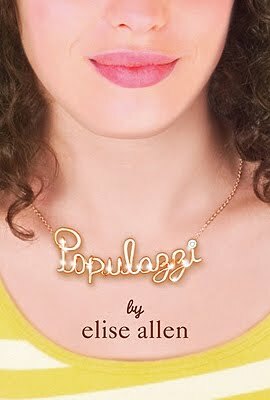 That’s the concept behind GCC member Elise Allen’s new book, Populazzi, published this month through Harcourt. Q: In ADIOS TO ALL THE DRAMA, Mariana is a bridesmaid in her cousin's wedding. How many times have you been a bridesmaid and what's the worst dress you ever wore? Elise: I’ve been a bridesmaid twice (if you count maid of honor), and both my sister and my sister-in-law were very good to me in the dress department. I don’t have a single complaint. Q: I've used some of my personal background in each of my novels. Did you take any snippets from your real life when writing your latest book? Base any characters on real people? Elise: Oh sure, there are definite snippets from my real life, but they’re very different in the context of the book. For example, when I was younger I had a tough time feeling like I fit in with my Dad and his second family… with the exception of one Christmas, when his then-wife pulled out all the stops to give my sister and I this magical holiday, which was even more magical since we’re Jewish and don’t celebrate it, so the trappings of Christmas were exotic and wonderful. Cara recalls a similar experience in her past, though it plays out a little differently than mine did. As for basing characters on real people… I sometimes start from a real person for inspiration, but eventually the character grows and morphs into someone much more unique. Q: Let's talk publishing. What was harder for you, finding an agent or an editor? Why? Elise: Definitely harder finding an editor, since my agent sought me out. I had a unique path to publication; my agent started out as a TV exec, and I met her when I pitched her a TV movie. We went back and forth developing the idea, but before we could get it off the ground, she left the company. A year or so later she switched to agenting, and called to see if I had any book ideas. As for finding an editor, I developed Populazzi as a pitch with sample chapters, then went to New York on a whirlwind trip with my agent and pitched to what felt like an endless parade of editors. A few of them were interested in the book, but Samantha McFerrin was clearly the perfect match, and I loved working with her. I’d do it again in a heartbeat. Elise: Edith Wharton’s Custom of the Country. Her version of the very stratified society of turn-of-the-last-century Manhattan reminded me a lot of the very stratified society of high school. Populazzi is a very different kind of book than Custom of the Country, which is a biting satire with a very unlikable protagonist, but that was the initial inspiration. Elise: DISNEYLAND!!!! I was waiting for the rafts to Tom Sawyer Island (whatever – I don’t care how much pirate stuff is there, I refuse to call it Pirate Island – it’s Tom Sawyer Island) when I got the call from my agent that we had some offers. At that point I knew it would be published somewhere. When I learned the deal was cemented with Harcourt, I was in my car driving to dinner with my dad and his family. They were visiting L.A. and we’d planned a meal at some fancy-schmancy Italian restaurant in Beverly Hills… so we made it a book celebration! Thank you, Elise! Now, everyone go out and buy books, lots and lots of books!